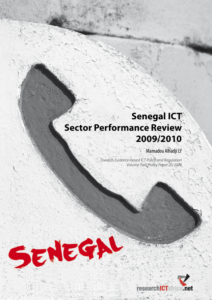 In 1994, the International Telecommunications Union ranked Senegal ahead of other sub-Saharan countries in terms of penetration growth and service quality. Senegal has made significant investments in the ICT sector. The country has been connected to the Internet since April 1996, and services linked to New Information and Communication Technologies (NICT) are booming. The network is made up almost entirely of fibre optic cables. The institutional environment of the telecommunications sector is marked by the presence of a public authority, which determines sector policy. This policy is based on a system of which the President of the Republic is at the centre. Under the aegis of the Special Advisor of the President of the Republic (who is in charge of new information and communication technologies), there are two essential state policy instruments in this area. They are the Agence de l’informatique de l’État (ADIE) and the Agence de régulation des télécommunications et des postes (ARTP), both associated with the Secretary General of the President of the Republic.